These days, you would be hard-pressed to find anything in your local supermarket that is meant for children that is non-sugary, or low in sugar. According to numerous studies done over the last few decades, sugar has been found to be directly related to a large number of health issues. Some of these diseases include obesity, diabetes, an increased risk of heart conditions and diseases, fatty liver, and dental problems. Sugar is also directly associated with increased health risks. In fact, added sugar is one of the biggest sources of hidden, empty calories that can be found lurking in various processed and pre-packaged foods. Most people aren’t aware of how much sugar there is in frozen foods, bottled drinks, fast foods, and many other types of processed foods that by right shouldn’t have so much sugar in their list of ingredients. Often, these sugars hide in plain sight under a variety of different names like fructose and corn syrup. As you can imagine, this is a massive amount of sugar can be damaging to the growth and development of a young child. Because of this, there has been a major pushback movement in America on a national level to focus on what school-going children are eating. This has not only resulted in regulations over what kinds of foods are served at school lunches, but has even gotten to the point that schools will monitor the pre-packed lunches that children bring from home. 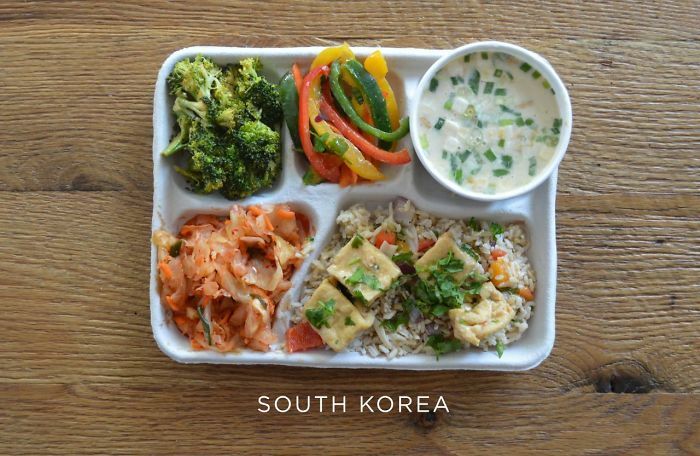 The United States, unfortunately, has some abysmal attitudes and approaches to school lunches, especially compared to the lunch cultures and foods found in other first-world countries. 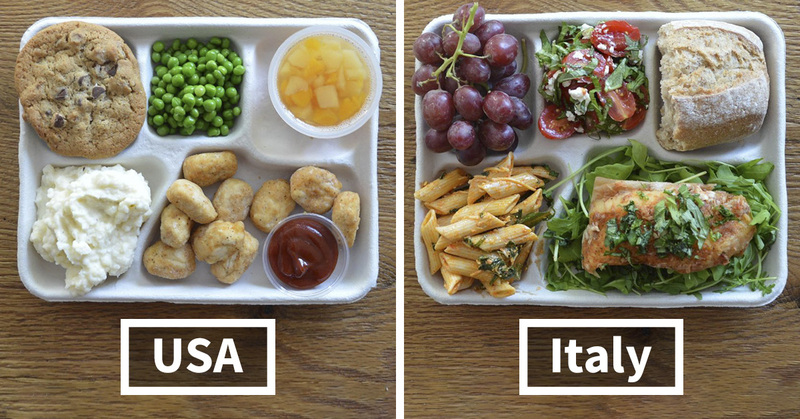 Here’s a list of what a school-going child eats for lunch in each country, and how the United States stacks up to the competition. 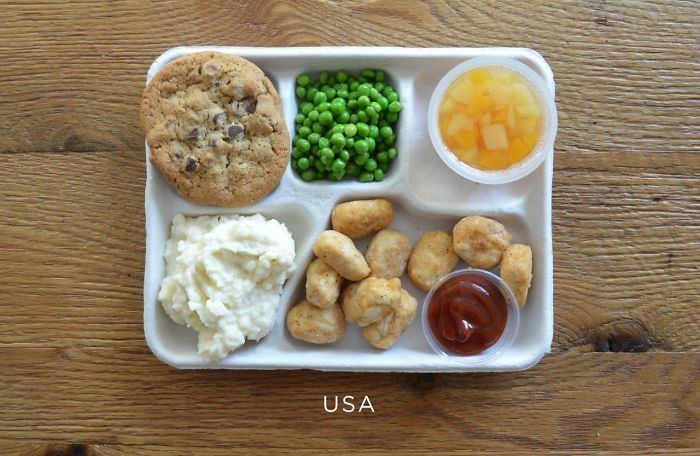 A fruit cup, a chocolate chip cookie, fried ‘popcorn’ chicken, peas, and mashed potatoes. 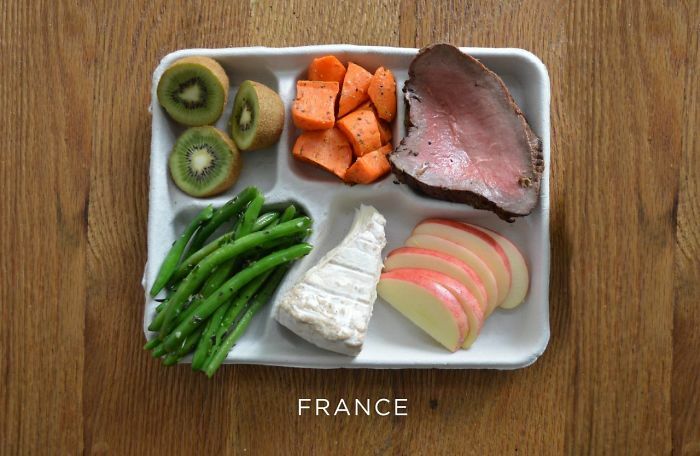 Fresh fruit, green beans, carrots, cheese, and steak. 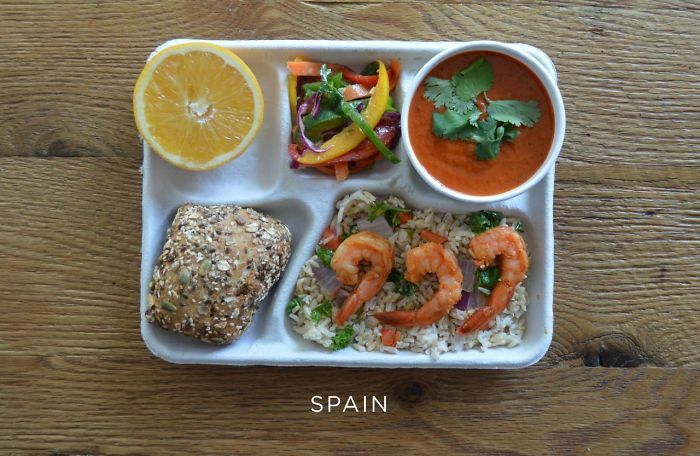 An orange, bread, fresh peppers, gazpacho, and sautéed shrimp over brown rice and vegetables. 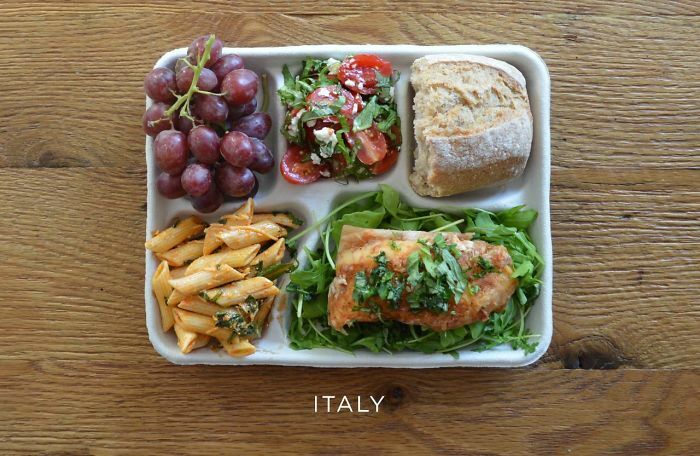 A bunch of grapes, Caprese salad, baguette, pasta with tomato sauce, and a local fish on a bed of arugula. 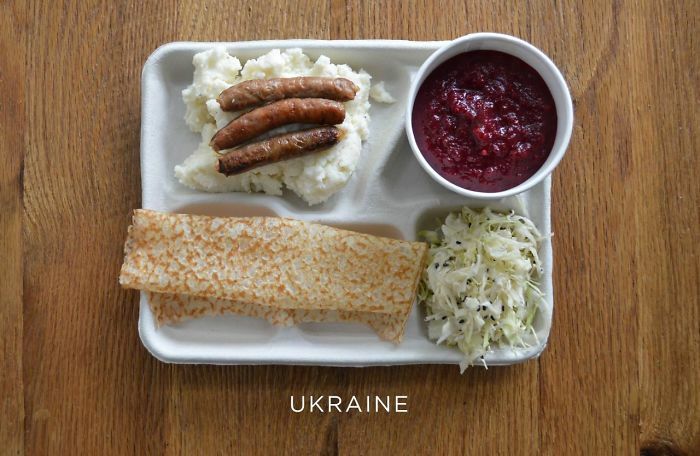 Syrniki (a dessert pancake), cabbage, borscht, and mashed potatoes with sausage. Salad, bread and baked plantains, black beans and rice, and pork with mixed veggies. 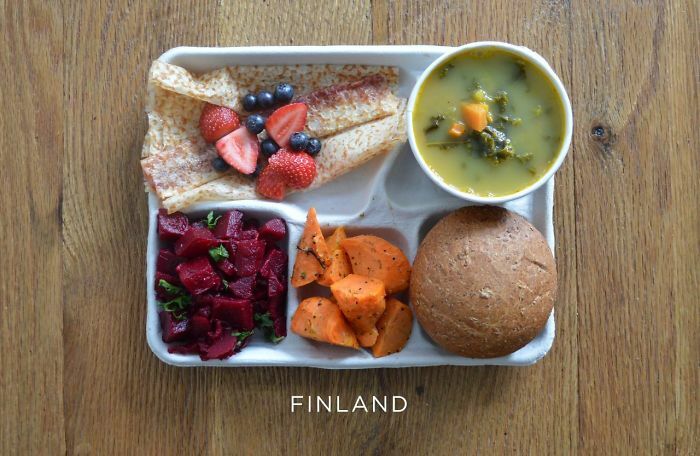 Fresh berries, bread and pannakkau (a dessert pancake), carrot salad, beet salad, and pea soup. 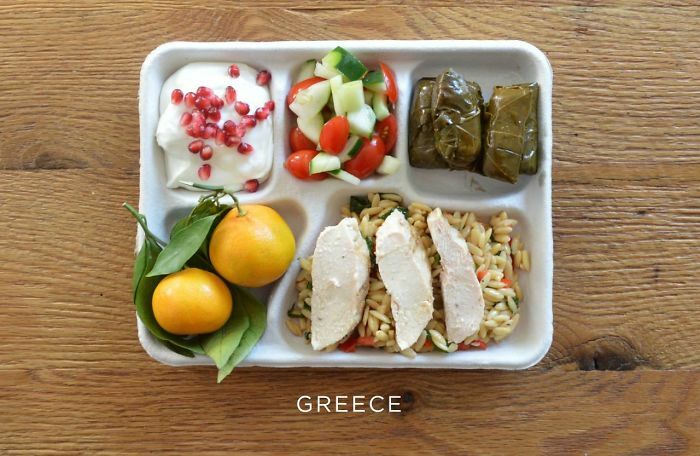 Greek yoghurt and pomegranate seeds, fresh oranges, stuffed grape leaves, tomato and cucumber salad, and baked chicken over orzo. Kimchi and fresh veggies, fish soup, and tofu over rice. 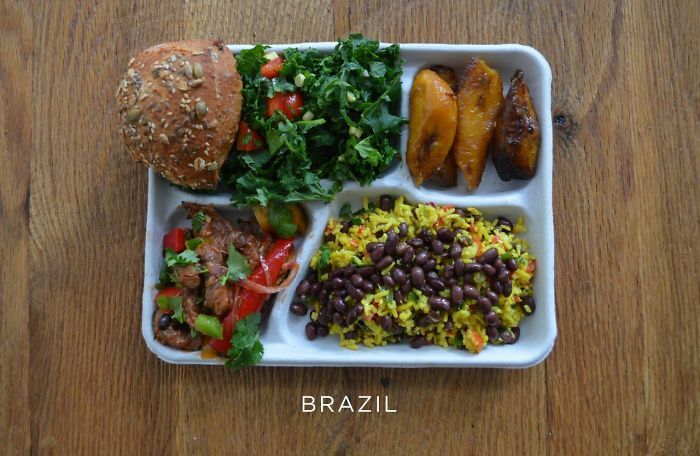 An occurring pattern that is instantly clear in all of these meals save for that of the United States’ is just everything in these lunches are unprocessed. In addition to that, many of these meals feature lots of fresh fruits and vegetables, and have been cooked in methods that use minimal oil, salt, and sugar. It is clear that the United States still has much to do to improve the quality of school lunches that the nation is feeding its children!